A year on from an assignment working for Bhutan's Ministry of Education, the FWBO's Clear Vision Trust (www.clear-vision.org) has just returned from an international conference on Buddhism and Ethics, held in Thailand near Bangkok.As education officer at Clear Vision, Munisha was invited to give a presentation on 'Using Video to teach Buddhist Ethics in British Schools' at the first conference of the International Association of Buddhist Universities (IABU). (The FWBO's Dharmapala College is a member of the IABU). Munisha's paper, titled 'Young People and Buddhist Ethics: Tradition and Commonsense' is available on FWBO Features here. This is a longer, written version of her PowerPoint presentation to the conference, which included video clips. 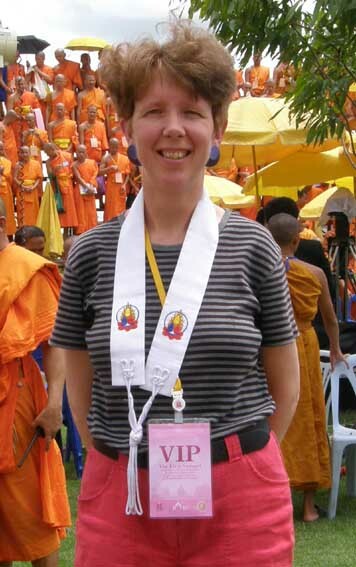 “It was extraordinary to be part of a gathering of up to 3000 Buddhists, mostly Asian monks, as well as nuns and a small number of westerners. I went with Mokshapriya and Aparajita. Among the robes of yellow or brown or stylish grey linen, our kesas attracted a fair amount of interest, as did our display of Clear Vision DVDs for schools. The Dharma is not yet available in such formats in Asia! "My strong sense is that young people of Buddhist background are losing touch with Buddhism, both in the UK and across Asia. You have to wonder whether there will be another generation of lay Buddhists as young people often know nothing of the Dharma and are less and less interested in tradition. To be fair, there were conference presentations from people who are running Dharma activities for young people in Burma, Thailand and Sri Lanka, one or two of them innovative, but still I suspect they are exceptions.Meanwhile, some very good teaching of Buddhism for young people is being delivered in British schools, by and for non-Buddhists, using modern teaching materials such as Clear Vision's. If Asian young people are to be interested in the Dharma, I'd argue Asian Buddhists could benefit from seeing what we are doing here in Britain. Click here to see what Clear Vision has to offer school teachers and students.